Ever since the housing bubble burst in 2007, retro-urbanists, such as Richard Florida, have taken aim at homeownership itself, and its "long-privileged place" at the center of the U.S. economy. If anything, he suggested, the government would be better off encouraging "renting, not buying." Similar thinking has gained currency with some high-rise (or multi-unit) builders, speculators and Wall Street financiers, who would profit by keeping Americans permanent renters, with encouragement from former Morgan Stanley financial analyst Oliver Chang, who predicted we were headed toward a "rentership society." Some support comes from research suggesting that higher ownership rates actually create unemployment. A study by the proausterity Peterson Institute for International Economics, cited recently both by Florida and the New York Times' Floyd Norris, lays out an econometric case against homeownership. The authors justified their findings by pointing to larger unemployment-rate changes from 1950-2010 in states, mostly in the South, such as Alabama, Georgia, Mississippi, South Carolina and West Virginia, compared with California, North Dakota, Oregon, Washington and Wisconsin. They then noted that, in the states with the larger unemployment rate increases, homeownership had increased more. Hence, the connection between higher homeownership and higher unemployment rates. This analysis is staggeringly ahistorical. It fails to correct for the massive labor market changes that have occurred in the Southern states, as the agricultural and domestic employment common in 1950 has largely disappeared. The analysis begins with a year in which three of the states cited to prove that lower homeownership is associated with lower unemployment had unusually high unemployment in 1950 (California was No. 1, Oregon, No. 4, and Washington, No. 6); unemployment in these three West Coast states averaged nearly double that of the Southern examples. Another ahistorical implication is that that the South experienced a huge increase in homeownership since 1950, as economically disadvantaged African-Americans began to buy their residences. An analysis by demographer Wendell Cox indicates that, even as labor markets were being radically altered, per capita incomes in relatively underdeveloped Alabama, Georgia, Mississippi, South Carolina and West Virginia rose during 1950-2010 at more than double the rate experienced in California, North Dakota, Oregon, Washington and Wisconsin (more than 140 percent, adjusted for inflation, compared with approximately 65 percent). The Peterson thesis is also undermined by a close examination of county homeownership and unemployment rates, which finds, generally, that large counties with higher rates of homeownership have lower unemployment rates. For example, among the nation's approximately 260 counties with more than 250,000 residents, those with homeownership rates above 70 percent have average unemployment rates of 8.1 percent. Among the counties with homeownership rates below 50 percent, unemployment rates average 9.6 percent. This is exactly the opposite relationship that would be expected from the Peterson Institute research. Finally, many large urban counties with the lowest homeownership rates – Los Angeles, Kings County (Brooklyn), New York County (Manhattan), Queens, Cook County (Chicago) and Philadelphia – also suffer well-above-average levels of unemployment and high levels of poverty. In contrast, suburban counties with high homeownership rates, like Nassau County, N.Y., Chester County (in the Philadelphia area), or Fairfax County, Va., boast considerably lower unemployment than their urban neighbors, and higher per-capita incomes. Most of the cities with the highest ownership rates, like Fort Worth and Austin, Texas, Indianapolis, Denver and Columbus, Ohio, all did very well in the most recent Forbes "Best Cities for Jobs" study. It is also alleged that countries with high ownership rates do worse than those with lower ones. And to be sure, troubled countries like Portugal and Spain have high levels of homeownership, while Germany, Sweden and Denmark have somewhat lower ones. Yet, many successful countries – Taiwan, Singapore, Norway, Australia, Canada and Israel – actually do quite well with higher ownership rates than in America. Dream that refuses to die. From a historic perspective, the present U.S. homeownership rate, 65.4 percent, does not represent a structural decline from the middle 2000s, as is often argued, but remains consistent with the virtual equilibrium achieved over the past half century. As recently as 1940, only 40 percent of Americans owned their homes, a share that reached 60 percent by 1960s. Since then, it has remained fairly stable. The modest decline from the middle 2000s was from an artificially high level that resulted from the virtual suspension of mortgage credit standards – egged on by Wall Street and government agencies – which was followed by a deep recession and a weak recovery. The housing bust changed the market, but not because of some fundamental shift in buyer preferences, as is sometimes alleged. Indeed, the recent spike in home sales confirms that Americans continue to aspire to homeownership. Research at the Woodrow Wilson Center indicated that 91 percent of respondents identified it as essential to the American Dream, and most favored steering government policy to spur homeownership. Much has been written about how the under-30 population is either living at home or cannot buy a house. Yet, surveys by generational chroniclers Morley Winograd and Mike Hais found that a full 82 percent of adult millennials surveyed said it was "important" to own their own home, which rose to 90 percent among married millennials. Another survey, this one by TD Bank, found that 84 percent of renters ages 18-34 intend to purchase a home in the future. Homeownership achieves almost cultish status among immigrants, who account for some 40 percent of all new owner households over the past decade. Among Asians who entered the country before 1974, a remarkable 81 percent own their home, while Latino homeownership is projected to rise to 61 percent by 2020. Critics of homeownership often point out that renters have far more flexibility to move; that's true and important particularly for people in their 20s. But, as people age, get married and, especially, have children, they seek to become involved in their communities on a more permanent basis. Pundits and economists often fail to recognize that people are more than simply profit-maximization machines ready to cross the country for an income increase of a few thousand dollars; they also seek out friends, stable neighbors, familial comfort, community and privacy. Homeowners reap the financial gains of any appreciation in the value of their property, so they tend to spend more time and money maintaining their residence, which also contributes to the overall quality of the surrounding community. The right to pass property to an heir or to another person also provides motivation for proper maintenance. Given their stake, homeowners participate in elections much more frequently than renters. One study found that 77 percent of homeowners had, at some point, voted in local elections, compared with 52 percent of renters. The study also found a greater awareness of the political process among homeowners. About 38 percent of homeowners knew the name of their local school board representative, compared with 20 percent of renters. The study also showed a higher incidence of church attendance among homeowners. People who own their homes also tend to volunteer more in their community, notes the National Association of Realtors. This applies to the owners of both expensive and modest properties. 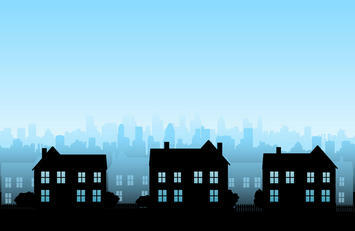 One 2011 Georgetown study suggests that homeownership increases volunteering hours by 22 percent. Perhaps the largest social benefits relate to children. Owners remain in their homes longer than do renters, providing a degree of stability valuable for children. Research published by Habitat for Humanity identifies a number of other advantages for children associated with homeownership versus renting, ranging from higher academic achievement, fewer behavioral problems and lower incidence of teenage pregnancy. Even before the American Revolution, the notion of ownership, usually of a farmstead, was a critical lure. Even after the yeoman utopia of the early 19th century faded, Americans continued to yearn for their own homes, something that led them in two great waves, first in the 1920s and again in the 1950s and 1960s, to the suburban periphery. In contrast to today's progressives, many traditional liberals embraced the old American ideal of dispersed land ownership. "A nation of homeowners," President Franklin D. Roosevelt believed, "of people who own a real share in their land, is unconquerable." Legislation under Roosevelt and successor presidents supported this ideal. More than a response to the market, governments embraced homeownership as a positive societal and economic good for the majority of Americans. This policy – brilliantly exploited by entrepreneurs – worked for both people and the economy. Almost half of suburban housing, notes historian Alan Wolfe, depended on some form of federal financing. The suggestion that we need to abandon what the New York Times denounces as the "dogma on owning a home" has grown deeply entrenched among retro-urbanists. Rather than facilitate the broad dispersion of property ownership across economic classes, the new orthodoxy suggests we would be better off as a nation of renters, living cheek-to-jowl in apartments. This works to the advantage of the Wall Streeters and other investors, who profit from our paying off their mortgages rather than our own. The assault on homeownership also pleases some advocates of austerity, such as Pete Peterson, who would like to eliminate the mortgage interest deduction as a way to raise revenue at the expense of the middle class. Turning against homeownership undermines the very promise of American life and the culture of independence critical to our identity as a people. Housing accounts for about two-thirds of a family's wealth and the vast majority of the property owned by middle- and working-class households. The house represents for the middle class, devastated by the weak recovery, both a chance to make a long-term investment as well as a place to raise a family; a Wall Street portfolio, for all but the very affluent, who can afford the best advice, provides no reasonable alternative. We have to consider what kind society we wish to have. The nomadic model now in fashion suggests Americans should simply move from place to place, untethered to any one spot, seeking personal fulfillment and the best financial deal for themselves. Such a model fits with current planning dogma and facilitates a source of profit for some, but undermines the dispersion of property that can sustain our society, and our families, over the long run. Update: The Pete Peterson referred to here is not the Pete Peterson running for office in California. Submitted by tom_8552 on Mon, 01/26/2015 - 16:15. I regarded the Peterson Study as "not passing the smell test"
Submitted by PhilBest on Tue, 06/04/2013 - 18:17. I an very glad you have done this analysis contradicting the Peterson "study", Joel.